Thermo Tracer TS9100 | Infrared Thermography | NIPPON AVIONICS CO.,LTD. 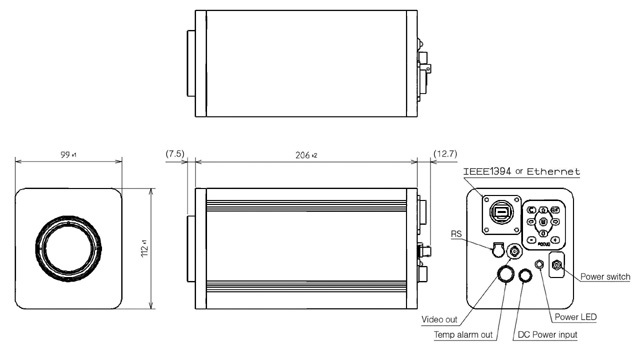 The camera has three alarm modes (two for temperature anomalies and one self-malfunction warning) which allow it to operate as a stand-alone unit. 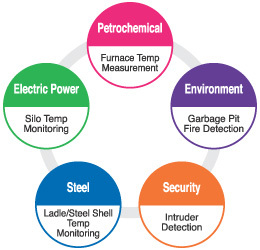 By using one of the interfaces (RS232C -standard, IEEE1394 or Ethernet - optional) a larger system can be configured for remotely controlled monitoring or real-time thermal image transfer. With various settings available for the alarm functions the unit can be operated independently. With the standard RS232C and optional IEEE1394 or Ethernet interfaces fast and large data processing systems can cover a broad field. 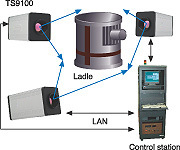 Multiple TS9100s can be connected and controlled within a large monitoring system. The continuous temperature data, vital for large applications, can be monitored and recorded on a real-time basis. This optional extra allows development of user's own software. The main unit has IP54 protection rating. An optional protection housing is available for extreme conditions of temperature or dust. 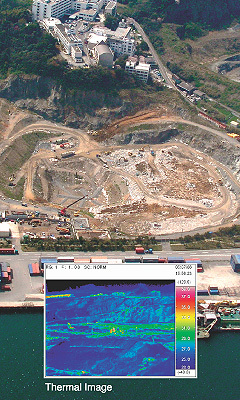 This system gives continuous overall coverage of the landfill site to detect potential fire risk in the most economical manner possible thus reducing the monitoring cost. If the measured temperature exceeds the set threshold the alarm signal is generated. 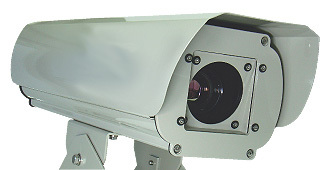 The TS9100 can output NTSC/PAL video signal for checking thermal images on the LCD screen. 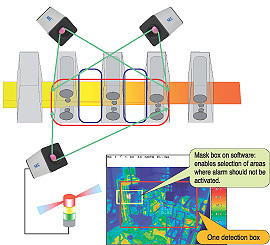 Monitoring cost reduction using 24-hour unmanned system. Further cost reduction is possible using one TS9100 mounted on the swivel unit to cover a wider area. This system monitors continuously the temperature of production line motors to detect overheating generated by potential failures. When measuring temperatures that are higher than the set threshold, TS9100 can output an alarm signal. Early warning of potential failures prevents costly breakdowns and production interruptions. This system measures the steel ladle exterior temperature, analyses the data and signals any over-temperature situation. Automatic monitoring of the steel ladle shell temperature with data analysis enables overheating to be signalled. Temperature distribution display indicates problem areas and location for prompt repair. Spillages of molten metal are prevented. Potential repair requirements are predicted and locations are automatically specified. Users can benefit from easy prediction for repairs and prevention of molten iron leakage. (calibrated at 0 to 100ºC. (calibrated at 0 to 120ºC. Note 1:When installing high temperature range,standard measuring range 1 and 2 can not be used. **When standard (21.7°)lens is used.